What is a good moveset for Decidueye? If you have a good moveset for Decidueye, post an answer below and upvote the best ones. Remember, this is for competitive movesets, not in-game. Ability, EVs etc should be included, and we encourage sets for VGC doubles as well as singles. Make sure to read all the guidelines here. Decidueye Pokedex & learnset for reference. Its a physical attacker with STAB Spirit Shackle and Leaf Blade. Spirit Shackle prevents Pokemon from trying to escape so I can land some hits on them. Assault Vest and 248 HP evs will allows it to survive hits against, pretty much, all of its weaknesses except dark, since most of its weaknesses are Special Attacks and as for Poison and Flying I rarely see anyone use those attacking moves. I didn't use Decidium Z because then I can save the Z-move slot for another Pokemon. and besides, I have also stated why I used assault vest. U-Turn to retreat. This has been useful for me in many times on Showdown. Why both sucker punch and spirit shackle? They are effective against the same types. Its like teaching Lucário of gen 4 and 5 both a fighting and steel type move. It is ineffective choice of type moves. With another different type move he can deal against more types. It's not all about type coverage. Sucker Punch is run alongside Spirit Shackle as it provides priority and some speed control, which this set lacks. Just ... never, ever use it over Spirit Shackle. You'd want to turn down U-turn over Spirit Shackle. So change it to U-turn / Sucker Punch, rather than Spirit Shackle / Sucker Punch. Spirit Shackle is a NECESSITY on Decidueye. And it's FAR MORE IMPORTANT than U-turn, geez. How did you get the long reach ability? A bit late by 2 days reply, but you could get it in a Pokebank Event from before. Don't know about now. This Decidueye acts of your choice of Hazard Remover or Spinblocker. Defog if you want to remove hazards, or SD/Baton Pass if you want to keep them. Swords Dance helps Decidueye beat Exacadrill and break through walls and generally be less passive. Baton Pass keeps up the momentum and eases prediction. Roost is an obvious choice for longevity. Combined with it's solid special bulk, Deci acts as a blanket check to electric and watertypes, which run around quite a lot these days. Leaf Blade is it's chosen attack because it helps break through the also numerous water types, though Spirit Shackle is a solid choice for hitting fire types that might try to switch in. Toxic is to cripple special walls, though you could go for a second attack instead. Shackles for a STAB or BBird to punish fighting types that might try their luck with Knock Offs. Speaking of which, keep it away from Knock Offs. Ghost/Grass offers some unique resistances, but a weakness to Dark and Poison aren't welcome. Deci appreciates Bisharp, not only to resist these two weaknesses but to punish defog users. Deci also doesn't like Pursuit trappers, do bring a fighting type and try not to double up on dark weaknesses. These are competitive movesets, so it doesn't really matter i think. One of the few flying types that actually resists Fighting and can beat Chinchou lacking Ice Beam with Leaf Blade. It's decent defensive typing allows it to check Timburr, Slow Mienfoo, Chinchou and Diglett. Swords Dance + Brave Bird is extremely strong and can even beat weakened steel types like Bronzor. Defog allows Rowlet to support the team through more than synergy, whilst Leaf Blade is a solid secondary STAB. Sucker Punch, while weaker than last gen, is still good for taking out Psychic or Ghost types and picking off weakened opponents or choice locked Pokemon. Roost is for healing off BBird and Stealth Rock damage. Stealth Rock is also a problem. Unlike it's fully evolved form, Rowlet is weak to the hazards it's removing. Hail teams propose a significant threat. Honestly so do most fast, strong Pokemon like Abra or Gastly, though both are susceptible to coverage and neither can switch in. Steel Types generally tend to wall it unless it boosts multiple times. Especially Magnemite and Defence-invested Bronzor, though Shadow Claw exists for the latter. Bulky pivot to offer Defog support. Roost allows this archer bird to remain healthy throughout the match. Spirit Shackle is a decent trapping move with an amazing offensive typing, but Leaf Blade can be used if your team already has Ghost attacks. U-Turn helps grabbing momentum and switching out of a bad tactical situation, all the while hitting Dark-, Psychic- and enemy Grass-type for supereffective damage. - Spirit Shackle (To trap the user so they can't escape). - Curse (Great combo with spirit shackle. Opponent is trapped while taking damage each turn). These Sets are Awesome. Especially the Physical one. An upvote for you. I don't think Decidueye will ever run an Assault Vest set, not gonna lie. Its physical bulk is far too low for that; most viable Assault Vest users have decent physical bulk, like Tangrowth and Conkeldurr, though there are some exceptions, like Tornadus-T, which has Speed in place thereof: Decidueye lacks both. I think its best set will be a Swords Dance set because it capitalises on Decidueye's nice special bulk to give it an easy time setting up. You seem to be misunderstanding the use of the Assault Vest; it's usually for slower Pokemon with low Special bulk, or faster Pokemon that enjoy the extra special bulk. With Decidueye's base 70 Speed bracket, it is neither. Its Special bulk is already so nice, anyway. Additionally, you have absolutely no longevity as you cannot run Roost, Synthesis, or Leftovers, and are locked out of the ever-important Sucker Punch and Decidium Z. With Brave Bird, you are worn down even faster, too. Don't run Assault Vest, it is incredibly counter-productive and an on the whole useless item. - Swords Dance allows you to double your Attack stat, allowing you to double your physical damage output. - Spirit Shackle is one of the strongest (and arguably the most viable) physical Ghost-type moves in the game. Unlike Shadow Claw, it has a nice Base Power, and unlike Phantom Force, the opponent cannot switch out into a better matchup easily. Not to mention that it traps the opponent in, too. All in all a fantastic move, and is definitely among one of Decidueye's strong points. With a Decidium Z attached, Decidueye can reliably nuke many threats and, to a lesser extent, physical sponges, thinking they can take the hit with ease. - Leaf Blade is reliable Grass-type STAB, with a fantastic high Critical Hit rate alongside a great Base Power of 95. - Sucker Punch allows you to pick off faster, more frail threats, thinking they can revenge kill Decidueye. Even with 252 Speed and a Jolly nature, Decidueye only hits 262 Speed; this is very mediocre, and makes Decidueye lose to most faster attackers, giving it a weak matchup against most Hyper Offensive teams. 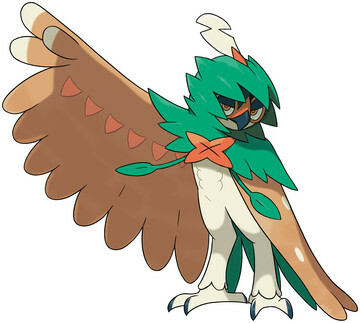 Conclusion: Decidueye is a great sweeper by virtue of its arsenal of the best physical Ghost-type move in the game, Spirit Shackle, which gains STAB with its Ghost typing. This, combined with the Decidium Z Crystal, gives Decidueye Sinister Arrow Raid, a 195 Base Power Ghost-type move that OHKOs pretty much everything in its path after a Swords Dance boost. Its access to Sucker Punch, the second strongest priority move in the game, means revenge killing it is difficult for most non-Dark resistant faster attackers. Defensively, it has a fantastic support movepool at its disposal, but finds it difficult to make use of it, what with its mediocre physical bulk, though its special bulk should not be overlooked; base 100 is great, especially for a largely-offensively inclined Pokemon. The Assault Vest set should not be considered by any means, as it locks Decidueye out of Roost, Defog, Haze, Toxic, and the like, meaning Decidueye has horrible longevity for a defensive Pokemon; all it does is give it nicer special bulk, which it doesn't need. It should only utilise an offensive set due to these traits. Other options: Decidueye can reliable run a Choice Scarf set, hitting 393 Speed, which makes it fall just short of the 130 Speed mark, which hits 394. This is nice and all, what with Decidueye's great Attack, but it is still underpowered by comparison to other sets, makes Sucker Punch useless, and locks it out of Sinister Arrow Raid. Still something to consider if your team needs something reasonably fast, however. Spirit Shackle + Curse = torture! You could also pick Defog over Curse since Decidueye is a great choice for removing hazards. Be careful using the Spirit Shackle+Curse combo as it takes two turns to set and Ghost types can switch out no matter what. Against a Sableye or Spiritomb, just watch out, and maybe pack a Fairy sweeper alongside that Decidueye just in case. 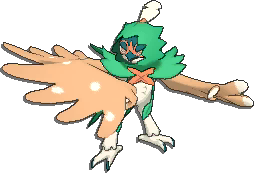 Usage: This Decidueye is meant to be a fast offensive mon, as well as a revenge killer for your team. The Ev spread and item of choice is pretty self explanatory. The choice between adamant and a jolly nature is entirely up to you. Adamant is preferred to allow it to hit harder since scarf already makes him fast enough, but more speed can be useful. Leaf blade is for obvious stab. Spirit shackle is for stab, and useful for trapping. Brave bird hits grass types hard. U-turn can be used for scouting, and allow decidueye to act as a fast pivot. Sucker Punch can be chosen over U-turn though, if priority is what you want. Explanation: Physical sets are good so how about a Special Attacking Moveset? Nasty Plot raises Special Attack by 2 Stages. Energy Ball is STAB and it has a Chance to Lower the Foe's Special Defense. Shadow Ball is also STAB and it also has a Chance to Lower the Foe's Special Defense. Hp Rock is Fire, Ice, and Flying type coverage as well as Bug type coverage. U-Turn To get damage and return Hence the name In 'n Outer. Spirit Shackle does 80 damage and if you choose to go the Ghostium Z It can turn into a 180 power Hit! isn't decidueye ghost grass therefore lacks rock weakness? You wouldn't run either Steel Wing or Brave Bird. Steel Wing hits no type in particular (Decidueye isn't Rock weak you know - and besides, it has Grass coverage to hit Rock-types anyway, which gain a STAB boost too, lol) and Brave Bird means you're worn down easily with the Assault Vest. Just no. Leaf Blade and Spirit Shackle for STAB and good damage. They're also physical attacks, which Decidueye is a physical attacker. Spirit Shackle traps opponents and is useful for Decidium Z, although if Decidueye is not the designated Z attacker, then it can have the leftovers to allow him to be a little tankier, and recover a bit from damage from Brave Bird. Brave Bird is for good damage and is also a physical attack. Synthesis can recover damage taken from Brave Bird and damage taken from other opponents. It's a physical attacker that makes use of moves that covers all of its weaknesses , as well as is present and previous types. Although, I would rather see it with its HA, thus allowing it to go along with its Archer archetype, its present ability helps with powering up is Leaf Blade STAB move even more. Having Steel Wing asked it to work on a more level playing field against Ice types while the possibly of U-Turn helps to round out against Dark types. If you choose not to go the U-Turn route, try keeping it away from Dark types unless you have a leaf level-wise that would make Leaf Blade a 1-Hit K.O. (with or without a Crit). Although, I focused my EVs in Attack, I chose to go the Speed route for more than one reason. One was the higher probability of evading moves (particularly Dark Type), while the other was the greater probability of critical strikes; and since most of the move pool that it is weak against are Special, I chose to place the rest of the EVs into Special Defense. This move pool, and EV placement has created for me a Pokemon that had worked under the most trying of battles, and I have no doubt that it would work for anyone else. This one is built to be a physical attacker that can out speed most Pokemon. choice scarf is used to out speed. long reach so it doesn't take damage from iron barbs, rocky helmet, rough skin, etc. adamant to get reliable ko's. jolly to make sure you out speed. With its Sp. Defence boosted by its Assault Vest, Decidueye will be able to take hits. Leaf Blade is STAB, Brave Bird is for power and coverage againts Bug-types, and U-turn is for switching out. Spirit Shackle is STAB and coverage againts Ghost-types, and prevents the target from escaping. Leaf Blade should be used for stab, as well as Spirit Shackle. Brave Bird can provide some solid damage if you can't do super effective damage. And Roost can be used to heal the recoil of Brave Bird or if you are low on HP. Spirit Shackle(Traps Foe Inflicted Curse). This Decidueye can be a Physical sweeper, support for Ground-types in Double Battles, and/or your Pokemon you choose to put a Z-crystal on.